Spiders really scare me. 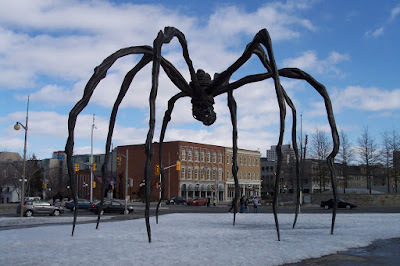 I would be terrified if they're as big as this "Maman" sculpture by Louise Bourgeois. It is now at the National Gallery of Canada (Ottawa). What about you? What scares you the most? Ghosts? Insects? Darkness? Do tell. Taken on January 2006, Ottawa, Canada. Why is that sculpture called 'maman'? Is it a mother of all spiders? Hehe That thing is the stuff of Ron's (harry potter series)nightmare. Did you take this photo? That's huge! I'm basically afraid of insects. But I used to think spiders are cute, the little ones in the web. Maybe because of the spiderman movies effect. I'm not afraid of ghosts because I'm used to it. I sort, um, have a 3rd eye. That's another story. But I'm usually bothered a day after watching any horror/suspense movie. i'm afraid of crocs, snakes and cadavers. ewww....now i'm having goosebumps. Layrayski, Yes, I took this photo two years ago in Ottawa. Maman is a French term of endearment for mother, so I guess it is the mother of all Spiders; that's how I understood it. witsandnuts, I have a slight fear of heights, but creepy, crawly things really scared me the most. I guess this is the effect of watching too many horror movies where insects can attack while you're asleep. ms. firefly, I agree, that sculpture is a monster. I stood below it, and there's actually a sac underneath it for eggs =). I hope I'm not grossing you out =). daphne, baby cockroaches are quiet easier to kill. the adult ones are quite scary, although they cannot escape the death sentence of my shoes or my slippers =). cockroaches are very common in hawaii. oh! spider pala yun? I thot ano siya, alien spacecraft. hehe :)gandang pic, sis. i'm scared of ugly, butu't balat, barking, teeth-baring dogs! takot talaga ako sa aso na tumatahol! yikes i don't like spiders and insects too .. i just don't like that feeling when they land or crawl on your skin.. yikes. hi anna, eew, dead rats...he he he. i do remember how badly they stink. i think i'd back away from their stench not from how they look. think of mickey mouse =). anonymous, hello. thanks for passing by all the way from italy =). sis, i thought dogs are the cutest pets on earth =). toni, i agree with insects. they really give me a fright. i like the new girlish look. i thought i should make some changes, i loved the flowers =). "sis, i thought dogs are the cutest pets on earth =)." of course they are, sis :) that's why I gave a particular graphic description..hehe... you probably haven't seen anything like that tho. Kase twice in my life, I was attacked by balding, very thin, hungry dogs. Can't blame me hah... :)but even then I love my Buko and her daughter Bulak--these are my dogs. Hi Angeli, I'm glad you like the sculpture. It's a fascinating sculpture, but my imagination of monsters gets the best of me. Sis, I hope you were able to ran away from that sort of attack from a stray dog. I was chased by someone's dog once, but I managed to get away. Thanks to my fast Igorot legs =). My, I didn't know Buko has a daughter now. Give Bulak a good pat on the head for me. Do you have any pics? I would love to see. I like the new look too. pretty and fresh, far better than the very first color of this blog which was a little drab then. good work! thanks artemis, i was a bit undecided about blogging again, but once i started, i got my inspiration to write and post photos again. glad you like the new look. i'm afraid of bugs, spiders included. especially flying roaches and huge beetles. eewww! hi caryn, interesting. if you have a photo of spider sculpture, please publish it. i want to see. is the one in roponggi also made by the same sculpture of maman? hope all is well. how strange for such a scary creature to be named after "mother". Hello Mimi, You're the second person who mentioned that there's something that looks like this sculpture. Please do publish yours, as I'd love to see it. Thank you for visiting.